On Thursday, June 4th, I will do a demonstration of how to make herbal vinegars and how to use them for the Heirloom Farmer’s Market at Spring Park in Tuscumbia, AL. I will have a variety of vinegars available for show and sale along with my books from 4:00 to 7:00 p.m. At 6 p.m. I will do a demonstration of how to make your own herbal vinegars, and attendees will be able to buy fresh herbs from the vendors at the farmer’s market so that they can make their own if they wish. I will also have an assortment of fresh vegetables and vinegars so that attendees may taste the various herbal vinegars to decide which they like best. There will be music in the park between 4:00 and 6:00 p.m. I look forward to doing the demonstration and meeting those in attendance as well as the various market gardeners who will be there to sell their fresh produce. Special thanks go to Sherry Campbell of the Shoals Culinary School for the invitation to participate. Victoria live on WGN Chicago cooking from her newly released book. Cooking on live television is interesting to say the least! Please tell your mommie and daddy that Nana is leaving for Chicago on Weds. Be a good girl, Nana loves you very much. For those unenlightened individuals, my first grandchild is due July 10th. Her name will be Madison Isabelle, or Madie. I just know we’re going to have loads of fun together. I’ve already shopped for her very own set of child-sized cookware and dishes for the playhouse I intend to put in the back yard. 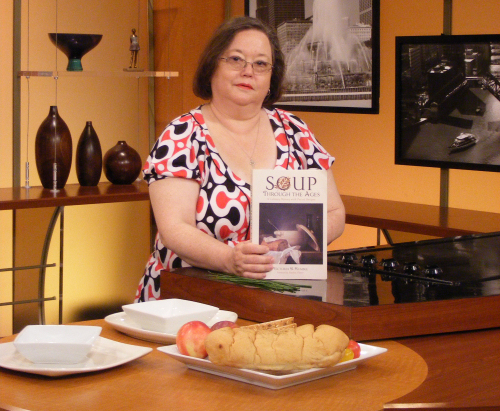 I have the honor of preparing one of the soups from my newly released book, Soup Through the Ages, A Culinary History with Period Recipes and discussing the book with the host of the Lunchbreak Segment for WGN TV, Chicago. I am excited to have an opportunity to discuss the delights of period foods with a diverse group of viewers. Often when I do cooking demonstrations they take place at some historic site which brings in, for the most part, history-oriented visitors. This will give me an opportunity to share the merits of one of the classic foods as it evolved through the centuries with people from all backgrounds. The Historic Foodie, Victoria Rumble. I found an interesting article this afternoon concerning the amount of food a family consumed within a year, or I should say more accurately, the amount of food the wife cooked for a year. A Michigan housewife kept a record of her kitchen endeavors and reported to her husband that she had prepared for a family of six: 325 loaves of bread, 83 tins of biscuit, 15 loaves of brown bread, 267 pies, 130 cakes, 35 puddings, 114 dozen cookies, 108 dozen ginger snaps, and 14 chicken pies. She did not include meats or vegetables in her record keeping. By studying this closely we can gain a bit of insight into how she spent her time. She fell short of baking a loaf of bread per week by 40 loaves, but if we count the brown bread and biscuit we can tell she baked some sort of bread more than a loaf per week. She made either pie or cake 397 times which is 32 more than one per day, and that is not counting the puddings and cookies. – The American Kitchen Magazine. April 1896. Boston. “Corn that grew in Tennessee in prehistoric times, possibly before Joseph put away his seven years’ supply in Egypt, was unearthed recently by W. E. Meyer of the bureau of American Ethnology and sent to the United States Department of Agriculture for identification. During recent excavations in Davidson County, Tennessee, Mr. Meyer came upon a number of stone slab graves containing mortuary vessels. Some of these held specimens of charred maize in fairly good condition. From the size and shape of the grains it was possible to identify the variety as many-rowed tropical flint, a form about halfway between true flint and popcorn. The same type of Indian corn occurs in the West Indies, and there is no question in the minds of scientists but that there was a very early communication between the West Indies and North America. Not only corn, but beans, squashes, pumpkins and tobacco are of tropical and subtropical origin. These staples, now so important throughout both hemispheres, found their way into North America and were cultivated beyond the Great Lakes in Canada long before the discovery of America. There is abundant evidence of communication between the West Indies and Florida and up the Mississippi and its tributaries.” – The Soda Fountain: An Illustrated Monthly Publication for the Soda Fountain Trade. June, 1922. NY. D. O. Haynes & Co. The Historic Foodie, April 26, 2009. A friend asked for period strawberry recipes and since I work the month of February every year in the heart of Florida strawberry country a few good recipes will mean lots of good food next year. The Plant City (FL) strawberry festival is an annual event which draws crafters and “everything strawberry” from around the nation. For the young and young at heart, strawberry ice cream should top the list of recipes. Those without ice cream freezers knew how to put the cream mixture into a pail, set that pail down into a larger pale filled with ice and salt, and turn the handle to make the pail with the cream freeze. Because there was no dasher to scrape the sides of the pail, it was necessary to scrape the sides with a spoon periodically so that it would freeze through evenly. I have a wooden ice cream churn that I plan to use to freeze strawberry ice cream at Cracker Country next February. No piece on strawberries would be complete without discussing strawberry jam. Jam wasn’t just for breakfast in earlier times, it was as likely to top pound cake, or be combined with whipped cream and cake to prepare a trifle. “Strawberry Jam. Take some of the finest scarlet strawberries gathered when they are full ripe, pick them from the stalks, put some juice of strawberries to them beat and sift their weight in double-refined sugar, and strew it over them; put them into a preserving-pan, set them over a slow fire, boil them twenty minutes, and skim them; then put them in glasses, when cold put brandy-paper on them, &c.” – Briggs, Richard. The English Art of Cookery. London. 1788. The recipe refers to sugar when it came in blocks and had to be nipped off and pounded to make it granular, and the early method of preserving was to place the jam into a bottle or crock, cover it with paper which was tied tightly around the top of the container, and then brush it with brandy, multiple times if felt prudent, and allowed to dry. It was believed doing so sealed out the air and thus preserved the jam. In earlier days, when cows or calves were slaughtered the bladders were preserved so that they could then be stretched over the tops of the containers which also sealed out the air. In 1777, Charlotte Mason included receipts for strawberry giam (jam) and strawberry marmalade in her The Lady’s Assistant for Regulating and Supplying her Table. The receipts are very similar. Wouldn’t you say strawberry fritters sounds perfectly splendid? William Verral called them Des beignets aux fraises which he translated to Strawberry fritters for his receipt in 1759. The receipt is indicative of the 18th century custom of stacking foods into pyramidical form for visual appeal. That style continued into the 19th century. – Verral, William. The Complete System of Cookery. London. T. Williams added lemon zest to his batter and topped the fried fritters with a dusting of sugar for a little added flair. The Accomplished Housekeeper and Universal Cook. 1797. London. Louis Lemery extolled the virtues of strawberry wine in his 1745 A treatise of all Sorts of Foods, Both Animal and Vegetable. London. When there aren’t enough strawberries available to make wine, one might think of making cordial which can be tailored for any amount of available fruit. Strawberry pie references were appearing in print by 1840. A commonly printed recipe was vague in amounts and left much to the discretion of the cook, but no doubt produced excellent results if the number of times it was published are any indication. “Strawberry Pie is made in the same way also. [Wash and dry the berries and lay them thick onto the under crust. Strew a small quantity of sugar and and a trifle of flour over them; put on the upper crust, and bake half an hour]. This fruit is more acid and requires considerable more sugar to make it pleasant.” – Herald of Health. May 1863. New York. Receipts for Strawberry Cake from the 1840’s through the 1860’s seem to be more for a tart than what modern conceptions would be, but the results are delicious. The American Housewife. By an Experienced Lady. 1841. New York. Drayton & Saxton. Strawberry soup is so refreshing on a hot day, and no doubt has been enjoyed since the latter part of the 18th century. William Volmer published a recipe which is as welcome today as when it was published in ___. It is just one example of the cold fruit soup which were served as a prelude to dinner. “Strawberry Soup. Rub a soup plate of well picked and well washed strawberries through a fine hair sieve; sweeten the liquid with six ounces of pulverized sugar, add the juice of a lemon, and a bottle of good wine. The whole is now well mixed, poured into a tureen, covered and placed on ice. In the same manner dress cold raspberry and currant soup.” Volmer, William. The United States Cookbook. 1859. Philadelphia. John Weik & Co. It is apparent already that the ways in which strawberries were served and enjoyed were quite extensive, and limited primarily only by the availability of fresh berries. While bottled berries could be used in a variety of ways, such as the soup, writers advised that for other receipts, such as salads, only fresh berries should be considered. Given I am currently writing a book on the history of salads, I must, out of curiosity, end this article with a receipt for Strawberry Salad given that for areas in the upper South strawberries are just beginning to come into season. What could be simpler, or more refreshing as the temperatures soar? “Strawberry Salad. A large pottle of ripe strawberries , picked and put into a basin with two tablespoons of sugar, a pinch of powdered cinnamon, a gill of brandy, stir gently, and serve”. Soyer, Alexis. A Shilling Cookery for the People. 1855. London. A food writer can always find an opportunity to test recipes, like my daughter-in-law, Jennifer’s, baby shower. The entire menu came from recipes I’m testing for my next book on the history of salads. Each salad fit the occasion well, yet each has been served for well over a hundred years. Instead of mayonnaise, the chicken salad was dressed with sour cream and could easily have been served at any historic dinner. Aspic was commonly served for 18th century special occasions, yet today several guests asked for the recipe without realizing its long history. No ladies luncheon would have been complete without it in the 1950’s. With the aid of unflavored gelatin it can be made in minutes instead of the hours it took in decades past. Good food never really goes out of fashion, but in a modern kitchen it does get easier to prepare. My other daughter-in-law, Jessica, and her friend, Annie, made this gorgeous fruit salad in a carved watermelon basket. The fresh fruit was as delicious as it was beautiful. With the temperature hovering at 90 degrees, it was very refreshing. Chicken salad with sour cream dressing, shrimp salad, tomato aspic, cucumber salad in sour cream, home-made rye bread, heart-shaped cornbread muffins, honey butter, carrot-raisin salad, and green bean salad rounded out the menu. My friends, Jason and Dawn, from near Tampa, Florida provided the honey that was used in the honey butter. Jennifer’s mother, Becky, did a wonferful job with the dessert table. An Italian cream cake, an assortment of cookies, and mini-cupcakes with strawberry glaze from a Giada de Laurentis recipe were delicious. I am looking forward to some of the cupcakes with my coffee in the morning! The table was covered with an antique quilt top from the depression era that I bought when my friend, Betty, and I attended an auction in the mountains last April. With special touches like the tablecloth to remind me of the wonderful weekend we spent at her mountain cabin, and the honey processed by friends I look forward to seeing every spring, I felt blessed even though distance prevented most of my friends from being here. As a remembrance, and a way of including my grandmother, the flower arrangements were made up of her favorite flowers, snowballs and roses with some wisteria, azalea blooms, rosemary, lemon balm, and mint. The herbs smelled wonderful, and the greenery looked amazing against the snow white blooms. She was a graceful loving lady, a true Southern lady, who loved her family dearly. I have never felt her presence as much as I did this morning while cutting these fresh flowers from my yard. The snowball bush is a family tradition. No matter where the men in this family move us to, we Gray ladies always plant a snowball bush the first thing. We have rooted cuttings from one generation to the next for several generations, always moving them with us wherever we go, so, as you can see, cutting flowers from that bush whose ancestors once graced my grandmother’s yard, for a shower for her great great granddaughter was my way of honoring her. It is not everyday I get to celebrate such a wonderful occasion, and I enjoyed the day and my guests immensely. We are very appreciative of all the wonderful gifts Jennifer received, and Madie Isabelle is going to be one very loved, very treasured, and probably one very spoiled young lady. What else are grandmothers for? Soup Through the Ages, released! 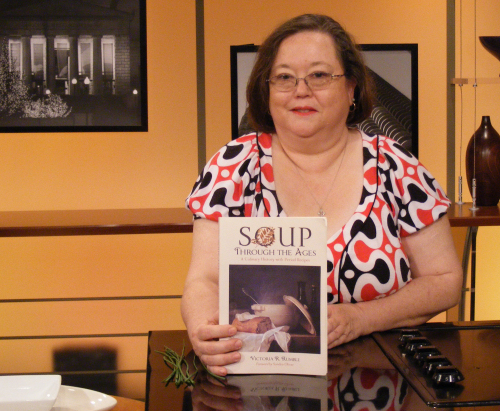 After a tremendous amount of research, countless hours searching for appropriate photographs and illustrations, not to mention numerous proof-reading sessions and a marathon week of indexing my latest book, Soup Through the Ages: A Culinary History with Period Recipes is in print and ready for your book shelf. I am totally pleased with the staff at McFarland Publishing and appreciative of their efforts to produce a top quality product while working with me to keep my personality shining through. The cover design is awesome! I would like to thank everyone who suggested resources, critiqued a chapter, offered suggestions on layout and organization of chapters, and helping with proof-reading. In particular I’d like to thank authors Andrew Smith, Sandra Oliver, and Peter Rose; Liz Williams of the Southern Food and Beverage Museum, historians Steve Abolt and Ned Jenkins, Jennifer Rumble, native historians Archie Matuck, Jim Sawgrass, and He Who Stands Firm. The staff at the Library of Congress were very helpful in navigating through their collections while avoiding copyright problems, and the interlibrary loan staff at the Florence Lauderdale Public Library were a huge help in obtaining some very rare books for me. A great deal of appreciation is showered on the stores who stock the books. To order the book, google the title and several sources will pop up such as McFarland’s website where you can order directly from the publisher, amazon.com, target.com, etc. All wholesale orders will ship from McFarland. Individual copies may be obtained from me (Thistle Dew Books) or from McFarland. thistledewbooks (@) yahoo.com. (Separated to reduce spam, type all together). All hands break off and start for home, and are ready to sit down at the table just as the sun is square on the window-ledge, and the sand in the hour-glass is out. A blessing craved, they begin with the Indian pudding, and relish it with a little molasses. Next come a piece of broiled salt pork, or black broth, fried eggs, brown bread, cabbage, and cider. They denominated their dinner, ‘boiled victuals;’ adn their plates, ‘wooden trenchers.’ Dinner despatched in fifteen minutes, the time till one o’clock was called ‘nooning,’ when each laborer was free to sleep or play. Nooning over, they repair to the fields, and find that a fox or wolf has killed a sheep, and eaten his dinner. the father takes his gun and hastens in search, telling the boys ‘to keep at their work, and if they see the fox, to whistle with all their might.’ The fox, that took great pains to be there when the owner was away, now takes great pains to be away when the owner is there. A drink of good beer all round, at three o’clock, is the only relief in the afternoon’s toil, which ends at five; at which hour the youngest son drives home the cows, and the milking is finished at six. The hogs and sheep are now called to their enclosures near the barn, where the faithful dog will guard them from their night-prowling enemies. All things being safe, supper is ready. The father takes a slice of cold broiled pork, the usual brown bread, and a mug of beer, while the boys are regaled with milk porridge or hasty-pudding. In their season, they had water-melons and musk-melons; and for extra occasions a little cherry wine. Sometimes they had boiled Indian corn, mixed with kidney beans. Into bean and pea porridge they put a slice of salted venison. They had also succatash, which is corn and beans boiled together. The meat of the shag-bark was dried and pounded, and then put into their porridge to thicken it. The barley fire-cake was served at breakfast. They parched corn, and pounded it, and made it into a ‘nokake’. Baked pumpkins were common”. – The History of the Town of Dorchester, Massachusetts. 1859. Boston. Dorchester Antiquarian and Historical Society. Brown bread was considered healthier in earlier times, just as whole wheat is considered healthier than white today. It was made from rye and Indian meal in equal proportions. “Add salt to the mixture, wet it with water and yeast enough to raise it; the dough should not be made hard enough to mould. Stir it with a spoon as thick as you conveniently can; put it immediately into the baking pan, smooth over the top with your hand wet in cold water, and let it stand till the top cracks. Then bake it in a hot oven. If a thick loaf, four hours. Some people put molasses into this bread, but molasses, I think, renders it unwholesome and unpalatable. Good Indian meal and sweet rye flour are much better without molasses in it. Another method is mixing one third wheat, one third rye, and one third Indian, and proceeding as above”. – Bliss’s Practical Cookbook. 1850. Philadelphia. Lippincott. 2 pkg. yeast, 2 1/2 cups war to the touch water, 2/3 cup molasses, 5 cups bread flour, 2 cups rye flour, 1 tablespoon salt, 1/4 cup oil, 1/4 cup cocoa powder, 2 Tablespoons caraway seeds, optional. Dissolve the yeast in the warm water with the molasses. Let set about 5 minutes or until it starts to bubble and foam. Put the salt, oil, cocoa powder, 2 cups rye flour and about 2 cups bread flour in the bowl of a heavy duty mixer with the bread dough attachment in place. Turn on the lowest speed and slowly pour in the yeast mixture. While continuing to mix, add the remaining flour, as much as is needed of it, a half cup to a cup at a time, each time you add flour, slow the mixer down to the slowest speed until the flour is stirred in, then put on the 2nd or 3rd setting. Grease a large bowl with oil. Put the dough into it. Turn the dough over, so that the top is oiled too. Cover loosely with foil or a damp towel. Let set at room temp. [if room is cool, put it in the oven with a pan of hot water and/or oven light on] until the dough has doubled in volume – about 1 1/2 hours. Put your fist into the middle and press down to release some of the gas. Sprinkle the dough and counter top or work area with flour, put the dough on this and knead it a few times. Divide the dough in half with a sharp knife. Shape loaves as you wish, put the loaves into a prepared bread pan, cover with oiled wrap or foil loosely and let rise again, not quite doubling in volume but rising by about half its volume. This usually takes about 45 minutes. Bake at 350 to 375 degrees until done. Top will be brown and the loaf will sound hollow when tapped. – The Historic Foodie, copyright 2009. May not be reproduced without written permission. “Their Diet is Fish, Fowl, Bear, Wild-cat, Raccoon, Deer, Oysters, Lobsters roasted or dry’d in Smoke, Lampres, Moos-tongues dry’d, which they esteem a dish for a Sagamore. With hard Eggs Pulveriz’d, they thicken their broth; Indian-Corn and Kidney-Beans boil’d, Earth-Nuts, Chest-Nuts, Lilly-Roots, Pumpkins, Milions, and divers sorts of Berries; Cook’d after various manners”. – A Trip to New-England &c. from the book, Five Travel Scripts. Edward Ward. 1699. London.